Record-setting Hurricane Irma barreled over the Caribbean islands of St. Martin, St. Barthelemy and Anguilla early Wednesday, destroying buildings with its sustained winds of 185 mph (297 kph), with rains and storm surges causing major flooding. The US National Hurricane Center listed the Category 5 Irma as the strongest Atlantic hurricane ever recorded north of the Caribbean and east of the Gulf of Mexico. The storm continues to roar on a path toward the U.S. and British Virgin Islands, Puerto Rico and possibly Florida, or along the southeast coast of the US. In the meantime, a launch is scheduled from Cape Canaveral on Thursday, September 7. SpaceX is hoping to launch the US Air Force’s X-37B reusable spaceplane, but current forecasts put only a 50% chance of weather suitable enough on Thursday, and only 40% on Friday. We’ll keep you posted. For the latest satellite views, the Twitter accounts above are posting regular updates. On Sept. 4 at 17:24 UTC, NASA-NOAA’s Suomi NPP satellite captured this view of Hurricane Irma as a Category 4 hurricane approaching the Leeward Islands. 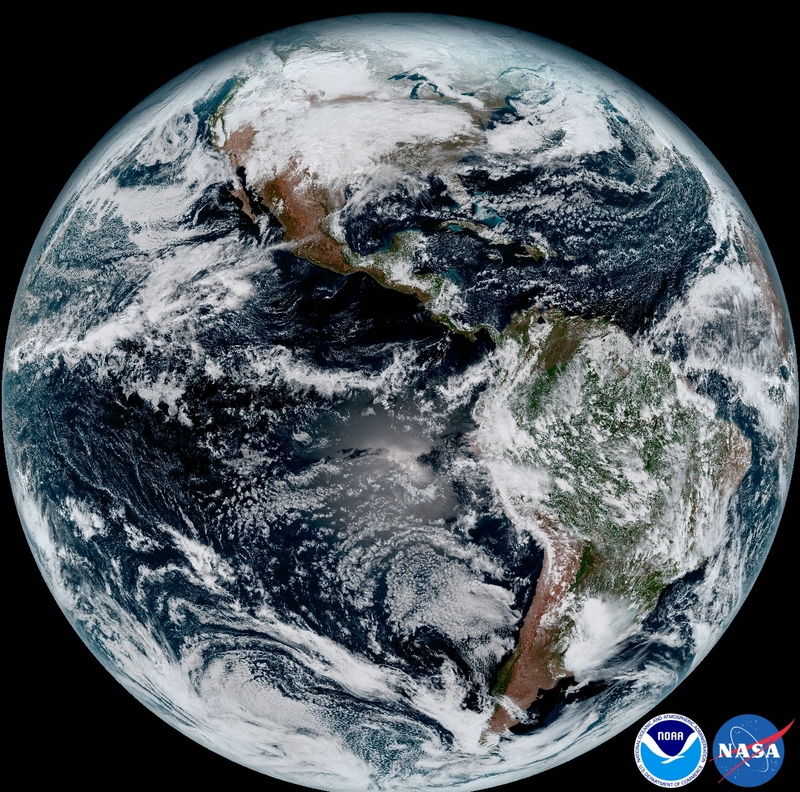 Credits: NOAA/NASA Goddard MODIS Rapid Response Team. NASA and Orbital ATK confirmed this afternoon that the launch of the Orbital ATK commercial Pegasus-XL rocket carrying the CYGNSS small satellite constellation has been rescheduled again to Thursday, Dec. 15 at 8:26 a.m. EST from a drop point over the Atlantic Ocean. Late last night the launch was postponed another day from Dec. 14 to Dec. 15 to solve a flight parameter issue on the CYGNSS spacecraft. New software was uploaded to the spacecraft that corrected the issue, NASA officials said. “NASA’s launch of CYGNSS spacecraft is targeted for Thursday, Dec. 15,” NASA announced. “We are go for launch of our #Pegasus rocket carrying #CYGNSS tomorrow, December 15 from Cape Canaveral Air Force Station,” Orbital ATK announced. Despite valiant efforts by the flight crew to restore the hydraulic pump release system to operation as the L-1011 flew aloft near the Pegasus drop zone, they were unsuccessful before the launch window ended and the mission had to be scrubbed for the day by NASA Launch Director Tim Dunn. The hydraulic release system passed its pre-flight checks before takeoff of the Stargazer. “Launch of the Pegasus rocket was aborted due to an issue with the launch vehicle release on the L-1011 Stargazer. The hydraulic release system operates the mechanism that releases the Pegasus rocket from the carrier aircraft. The hydraulic system functioned properly during the pre-flight checks of the airplane,” said NASA. A replacement hydraulic pump system component was flown in from Mojave, California, and successfully installed and checked out. Required crew rest requirements were also met. The one-hour launch window opens at 8:20 a.m and the actual deployment of the rocket from the L-1011 Tristar is timed to occur 5 minutes into the window at 8:26 a.m.
Live countdown coverage on NASA’s Launch Blog begins at 6:30 a.m. Dec. 15. Coverage will include live updates as countdown milestones occur, as well as video clips highlighting launch preparations and the flight. A prelaunch program by NASA EDGE will begin at 6 a.m. The weather forecast from the Air Force’s 45th Weather Squadron at Cape Canaveral has significantly increased to predicting a 90% chance of favorable conditions on Thursday, Dec. 15. The primary weather concerns are for flight cumulus clouds. 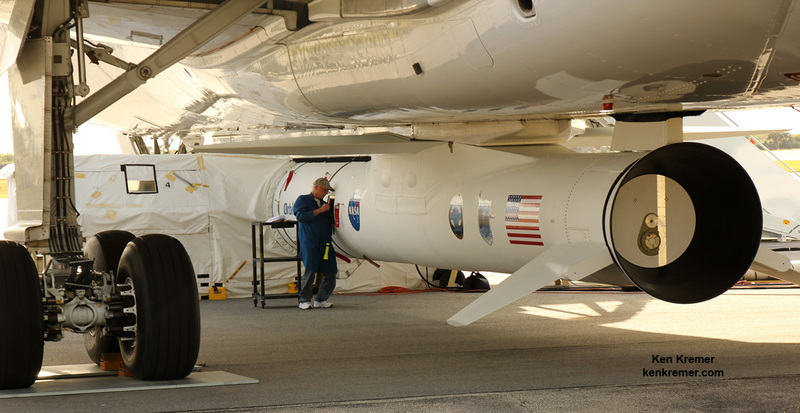 The Pegasus rocket cannot fly through rain or clouds due to a negative impact and possible damage on the rocket’s thermal protection system (TPS). In the event of a delay, the range is also reserved for Friday, Dec. 16 where the daily outlook remains at a 90% chance of favorable weather conditions. After Stargazer takes off from the Skid Strip early Thursday around 6:30 a.m. EST, it will fly north to a designated drop point box about 126 miles east of Daytona Beach, Florida over the Atlantic Ocean. The crew can search for a favorable launch point if needed, just as they did Monday morning. The drop box point measures about 40-miles by 10-miles (64-kilometers by 16-kilometers). The flight crew flew through the drop box twice on Monday, about a half an hour apart, as they tried to repair the hydraulic system by repeatedly cycling it on and off and sending commands. “It was not meeting the prescribed launch release pressures, indicating a problem with the hydraulic pump,” said NASA CYGNSS launch director Tim Dunn. The rocket will be dropped for a short freefall of about 5 seconds to initiate the launch sewuence. 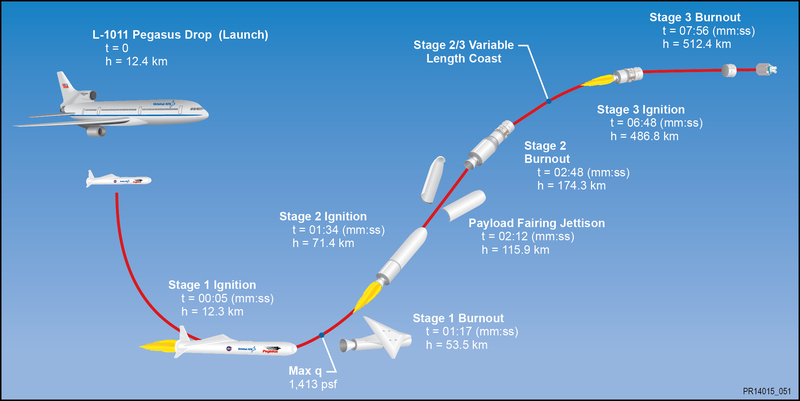 It launches horizontally in midair with ignition of the first stage engine burn, and then tilts up to space to begin the trek to LEO. The $157 million fleet of eight identical spacecraft comprising the Cyclone Global Navigation Satellite System (CYGNSS) system will be delivered to low Earth orbit by the Orbital ATK Pegasus XL rocket. 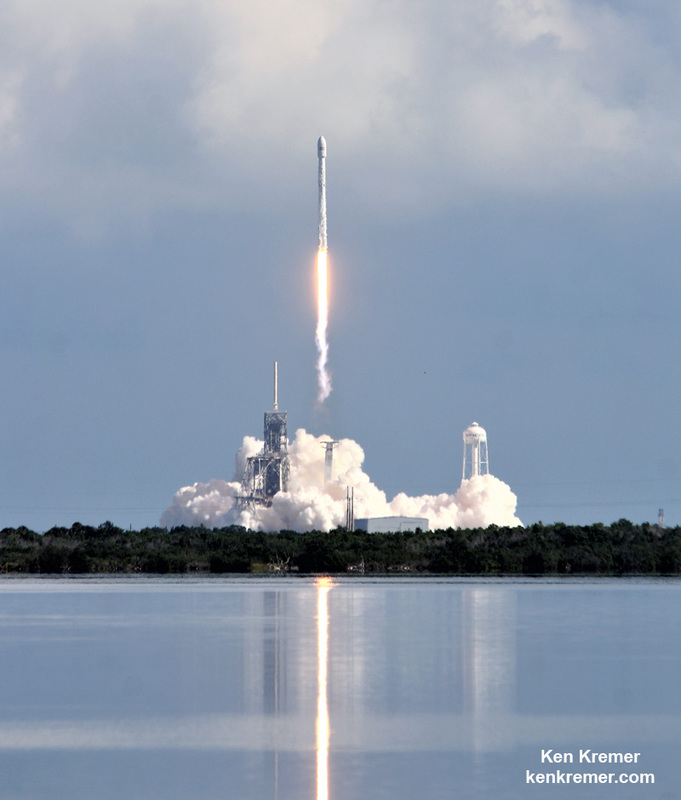 Pegasus launches from the Florida Space Coast are infrequent. The last once took place over 13 years ago in April 2003 for the GALEX mission. The Kennedy Space Center (KSC), Cape Canaveral Air Force Station (CCAFS) and the major population centers along the Florida Space Coast were spared from major damage to infrastructure, homes and business after the deadly Cat 4 Hurricane Matthew grazed the region with 107 mph winds rather than making a direct impact as feared. Although some of the base and Space Coast coastal and residential areas did suffer significant destruction most were very lucky to have escaped the hurricanes onslaught in relatively good shape, when it stayed at sea rather than making the forecast direct hit. KSC’s iconic 525 foot tall Vehicle Assembly Building (VAB), the Complex 39 launch pads and the active launch pads at CCAFS are all standing and intact – as damage evaluations are currently underway by damage assessment and recovery teams from NASA and the US Air Force. As Hurricane Matthew approached from the south Friday morning Oct. 7 along Florida’s Atlantic coastline, it wobbled east and west, until it finally veered ever so slightly some 5 miles to the East – thus saving much of the Space Coast launch facilities and hundreds of thousands of home and businesses from catastrophic damage from the expected winds and storm surges. KSC and CCAFS did suffer some damage to buildings, downed power lines and some flooding and remains closed. The Damage Assessment and Recovery Teams have entered the facilities today, Oct. 8, and are surveying the areas right now to learn the extent of the damage and report on when they can reopen for normal operations. “After the initial inspection flight Saturday morning, it was determined that the center received some isolated roof damage, damaged support buildings, a few downed power lines, and limited water intrusion,” NASA reported late today. Inspection teams are methodically going from building to building this weekend to assess Matthew’s impact. It will take time to determine when the center can resume operations. A “ride-out team” of 116 remained at KSC and at work inside the emergency operations center in the Launch Control Center located adjacent to the VAB during the entire Hurricane period. It took until Friday afternoon for winds to drop below 40 knots start preliminary damage assessments. Teams are also assessing the CCAFS launch pads, buildings and infrastructure. Some buildings suffered severe damage. “We have survived a catastrophic event that could have easily been cataclysmic. 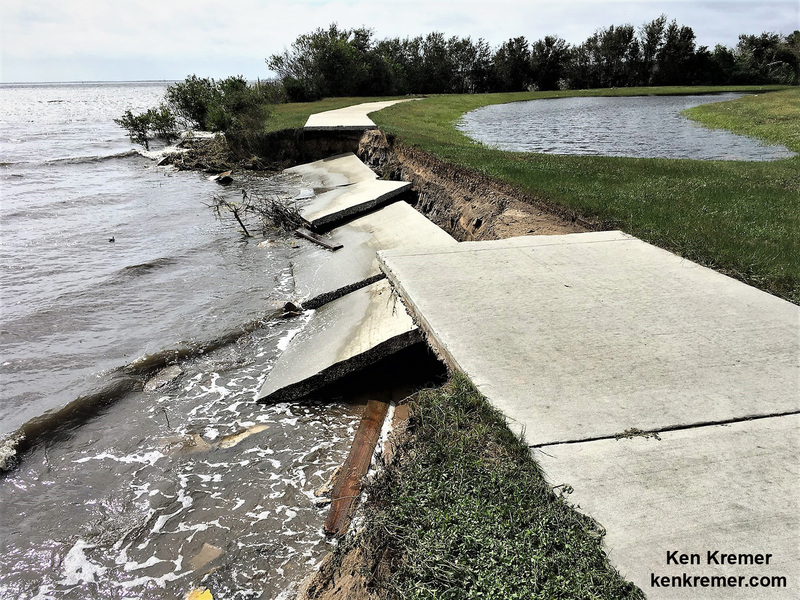 It is only by grace and a slight turn in Matthew’s path that our base and our barrier island homes were not destroyed or covered in seven feet of water,” wrote Brig. Gen. Wayne Monteith, commander of the Air Force’s 45th Space Wing at Patrick Air Force Base, in a Facebook update. 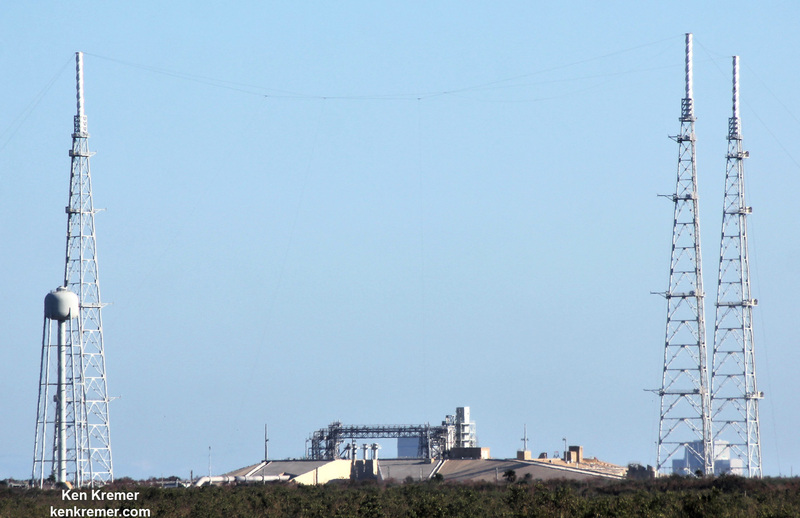 Of particular importance is Space Launch Complex 41 (SLC-41) where the next scheduled liftoff is slated for Nov. 4. 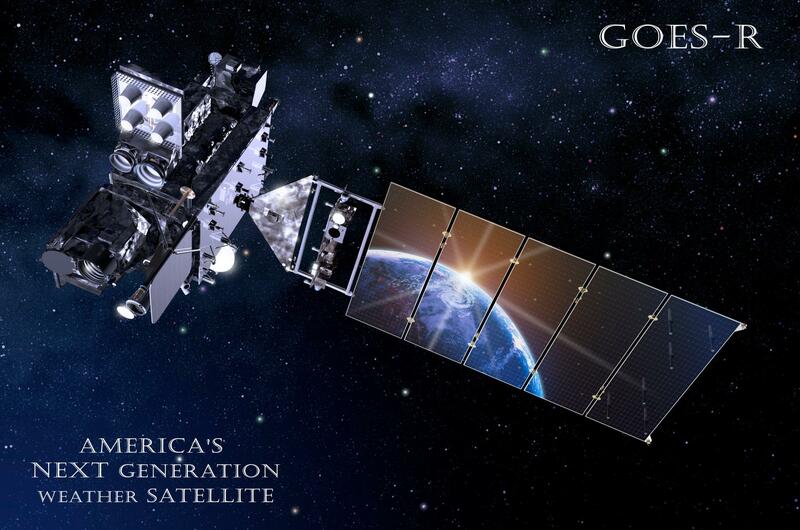 The launch involves America’s newest and most advanced weather satellite on Nov 4. It’s named GOES-R and was slated for blastoff from Cape Canaveral Air Force Station pad 41 atop a United Launch Alliance (ULA) Atlas V rocket. The major Space Coast cities in Brevard county suffered much less damage then feared, although some 500,000 residents lost power. Local government officials allowed most causeway bridges to the barrier islands to be reopened by Friday evening, several local colleagues told me. 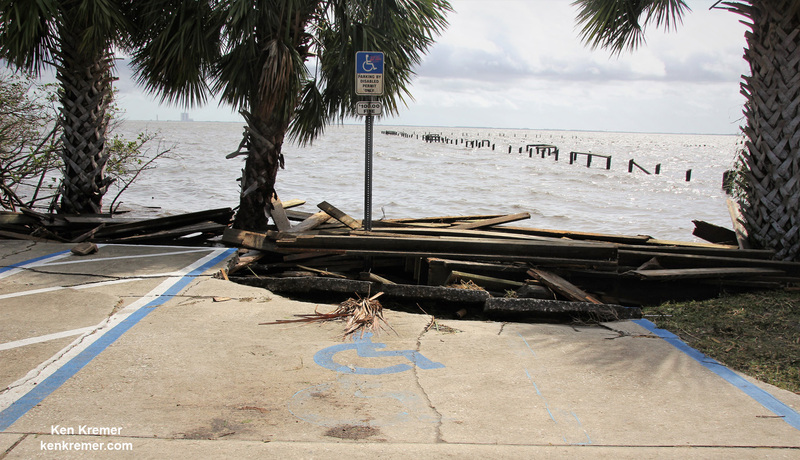 Here’s some images of damage to the coastal piers, town and a destroyed house from the Melbourne Beach and Satellite Beach areas from my space colleague Julian Leek.